Dual USB hub and card reader. 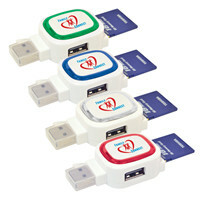 Accepts SD & Micro SD cards. Choice of 4 illuminating coloured rings. Unit lights up when plugged in. Optional 4GB Class 6 micro SD Card can be added at extra cost. Will record and play HD & Full HD video from 720p to 1080p/1080i. Mix and match with other Family items. Combine quantities of each product to make up to a qty break (ie min 25 units) and only pay 1 set up charge. Optional EVA black zippered pouch available at additional cost.